There aren’t a lot of things in this world better on a cold winter day than French onion soup. The richness from the caramelized onions. The melted then broiled cheese. The baguette croutons. It’s comfort in a bowl. Deeply satisfying. Wonderfully delicious. Amazing really, that something so good can be so simple. It seems obvious but it’s critical. Good French onion soup is real work. You need to cook the onions until they are deeply browned. Seriously. There’s no skimping that on that step. It’s mostly about caramelization of the onions. All those sugars in the onions cooking down to a wonderful mess of delicious. But there’s a bit of Maillard reaction going on as well. Magic. There is one cheese in my mind that is perfect for French onion soup. Gruyere. Other cheeses melt well but gruyere brings a little more depth of flavour. It’s up to you. You can use whatever cheese you want. But try gruyere at least once. You will be surprised. Expensive but worth it. For years, my go to recipe for French onion soup was Julia Child’s. The one in Mastering the Art of French Cooking. That’s a book they they will pry from my cold dead hands BTW. Then I snagged a copy of Anthony Bourdain’s Les Halles Cookbook. Both recipes are really, really good but I like his just a little better. This is the version from Les Halles with a bit of Julia’s technique. It’s the best of both in a bowl. A big gooey bowl of happiness. 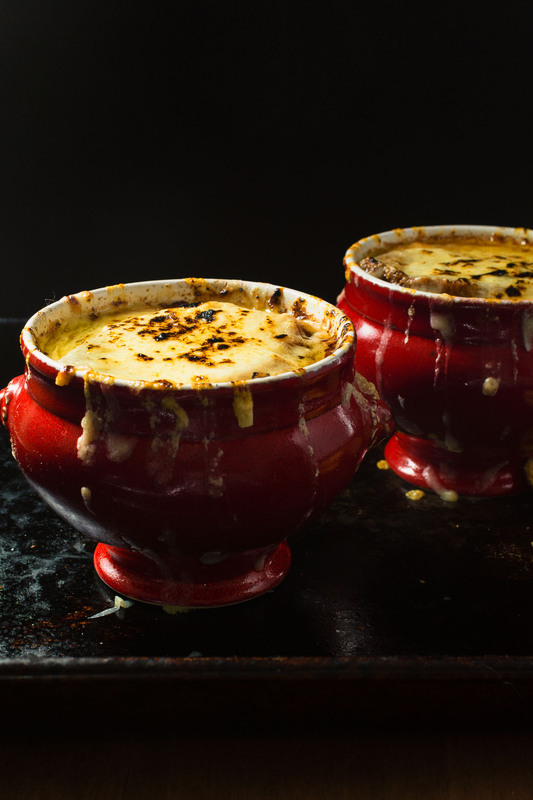 French onion soup is all about the onions. Take the time to brown them deeply and you will enjoy this classic dish as it's meant to be. 2 quarts good chicken stock. If there was ever a reason to make your own stock this is it. 4 ounces 4-5 slices best quality bacon diced. Don't skimp here. Melt the butter over low heat in a 5-6 quart heavy pot. Add the onions, stir and cover. Cook 15-20 minutes. Remove lid, turn heat to medium and cook, stirring occasionally, until the onions are well browned. This will take 30-40 minutes. It takes as long as it takes. This is how you make onion soup. Keep an eye on your onions. You don't want them to burn. Once the onions are browned, turn the heat to medium high and stir in the port and balsamic vinegar. Give it a good stir to scape up any of the brown fond in the bottom of the pot. Add the chicken stock, bacon and bouquet garni. Pre-heat your oven to 325F. Drizzle the slices of baguette with a bit of olive oil and toast in the oven. You can rub them with a bit of garlic if you like. Place your bowls on a cookie sheet. Ladle the soup into oven-proof bowls. Float two croutons on top and add a good amount of cheese. It's OK if it melts down the side. That's tasty too. Place the bowls and cookie sheet in the oven and broil until the cheese bubbles and browns. If you are making 8 portions and you don't have a double pass broiler consider doing them in two batches. Don't worry. The soup will be plenty hot. In appetizer, french, soup. Bookmark the permalink. Thank you. Funny, I never thought of it but something about the broth makes a lot of cheese work nicely I think. Can’t imagine it working on any other soup. 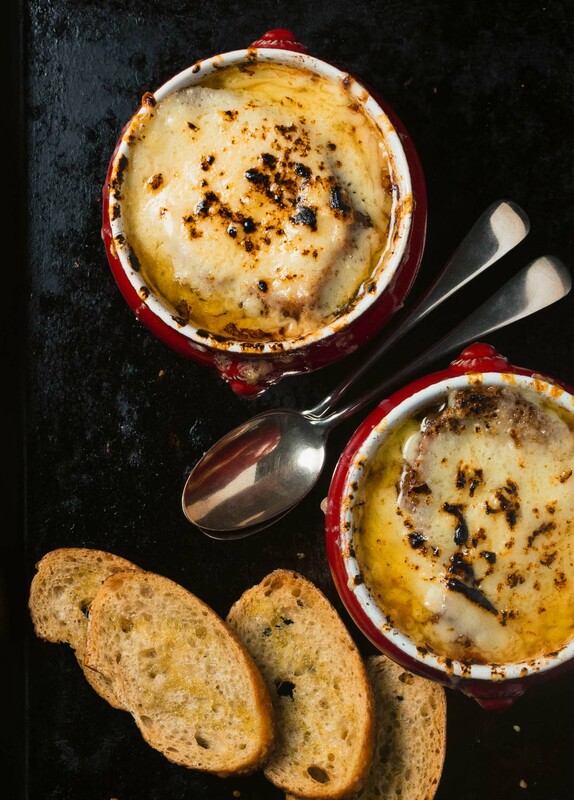 French onion soup is one of my all-time favourites! I love using gruyere for this soup; it melts beautifully! I’ve always used beef stock for my soup, but I need to try it with chicken stock too. What type of onions do you like to use? I’ve always used sweet onions. I’ve tried beef but don’t like it as much. I find the flavours come together better with chicken but I think that comes down to personal preference. I use regular yellow onions. Thanks for the catch. Recipe corrected. Even though I love onions, I’ve never had french onion soup! I need to make this before it warms up and I’m definitely following your recipe! Good Lord, this looks fantastic! I have never made French Onion Soup with Balsamic Vinegar! I bet that adds a whole other dimension of flavor. I’ve got to try this soon. Thank you Riva. It’s a nice treat every now and then. It’s pretty much dinner served with a simple green salad. My all time favourite comfort soup. The cheese looks so gooey and yummy. I am loving the bourdain’s twist in this with the port and balsamic! I can imagine it would give the onions even more of a wonderful earthy sweetness!! You know, I have Julia’s Child’s book, and I have never cracked it open! 😡 I’m terrible. haha but I will crack it open now on your high praise of it! I learned a lot from Julia Child. She was a real ground breaker and her classic approach to French is actually pretty approachable. Hope you find a jewel in it. Gorgeous photos, Romain! 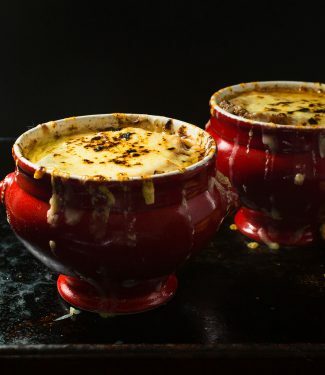 Who doesn’t love a good French onion soup? The perfect dinner for a cold night… or any night, really. Can’t wait to make this! It was pretty cold out the night I made this but you are right. French onion soup is great any night. For a lighter version you can just toast some baguette with a bit of grated parmesan and olive oil and float that on top. Not as decadent but still nice. Good Lord, this looks incredible!! Your photos are fantastic and I just want to reach right through the screen and mop up that browned cheese-covered soup with some bread. Delicious. I love hearing about the evolution of this soup! I’ve never actually read / owned a copy of Julia Child’s book and I really should. But our friends are HUGE fans of Bourdain… can’t wait to give this soup a try! Thank you so much! This soup is more Bourdain than Julia so I think your friends will like it. Wow, that looks amazing! Incredibly appetizing. I love a good French onion soup. Port and balsamic vinegar must give it a richness and fullness that the white wine doesn’t. Well done! Thanks Neena. It all comes together with each ingredient adding it’s own little dimension. But make no mistake – this soup is about onions first and foremost.